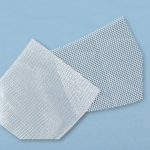 Non-absorbable surgical mesh knitted of transparent, monofilament polypropylene yarn with high degree of tolerance by human organism. THINLIGHT – universal mesh with standard pore size. The product list after point 6. OptomeshTM surgical meshes do not contain any allogenic or animal derivative substances. monofilament structure minimising the risk of bacterial infection. The OptomeshTM MACROPORE variant is recommended for treatment of extensive connective tissue defects (big hernias) whereas the OptomeshTM THINLIGHT variant has a universal scope of application. The OPTOMESHTM meshes are sold sterile - sterilised with ethylene oxide (EO) in a validated process in acc. with PN-EN ISO 11135 norm. According to EN ISO 10993-7, a mean daily EO dosis for a patient should not exceed 0,1 mg/day or 4mg during first 24 hours - the level of EO residues in surgical meshes introduced to the market is much below the abovementioned requirements. Sterility of OptomeshTM surgical meshes is confirmed with sterility tests for each production lot released for the market. The sterilisation indicators placed on each package prove the product's undergoing the sterilisation process. Bacterial endotoxin content in the lot is much below the requirements - the requirement being 20EU/device (in acc. with USP monoghaphy 161). OptomeshTM surgical meshes fulfill all the requirements specified in PN-EN ISO 10993-1 norm and they also posess a number of documented biological tests. Surface mass – depending on the variant between 60 and 85 g/m2 – assures the comfort of use for the patient. Mesh thickness – depending on the variantod between approx. 0,4mm to approx. 0,8mm – assures high mechanical resistance. Filament thickness –meshes are manufactured out of polypropylene yarn adequate for obtaining big pore size which, at the same time, assure high resistance to fixing suture pull-out. The OptomeshTM surgical meshes are packed in double medical packages (fulfilling PN-EN ISO 11607 requirements) - paper-foil bar or sleeve, adequate for EO sterilisation. On the outer packaging there is a TAG label (easy to peel-off, self-adhesive, identifying the device). The double package enables introducing the product into the operating field with no damage to its asepsis. Moreover, the transparent package enables having a look into the package and inspecting the implant. A sterile implant packed into double medical package with IFU and additional double TAG label included is placed in a cardboard envelope. Such package ensures safe storage within the guaranteed validity period.